LOL.. Yeah i would want to make mine just a few feet bigger each way but i tend to build to live in for the rest of my life and if i have a kid i would have to add on.. Your place looks awesome. What size are the loft beams you used, and do you mind my asking how much the LVL ridge beam ended up costing, and if you had it to do over, do you think you would use the 4 2x12's next time? I have commented on your place before and I would only have me and my wife to do that support beam in the UP of Mi, lots of snow load here too. Hi Dreamer - thanks for the compliments. The beams are 4x6 except those around the stairs, which are 4x8. I'm happy with the LVL and would use one again. It really wasn't as heavy as it looks, and could be put into place with just the two of you, if only by degrees. When we got it up, it was just me, my son and my daughter's boyfriend. And it was a breeze to get in. The cost was $6/foot. I bought it long, at 20 feet, or $120 all told. Very nice build. Topsham's a nice town, have you ever gone over to see the Barrel Man? I'm in Williamstown, half an hour or so north of you. Hi Abbey - I'm embarrassed to say that I've not done too much exploring in the area yet. I hope that'll change this year, now that we're down to siding and flooring (mostly) left to do. I'd love to do some hiking in the Groton State park, as well as some brewery trips to Hill Farmstead and Alchemy, among other things. As I'm looking into solar, it seems like a good idea to seek out the Barrel Man. Meanwhile, come on over sometime for the 1 cent tour (that's about all it takes ). It's difficult to spend time driving around when you're working the whole weekend building. I was not happy when the Alchemist did not re-open after the floods, I miss the beer cheese spread and pretzel. Be warned, the Barrel Man is a talker, so plan on spending a good hour there, probably longer. He's a nice guy and he's always trying different things. 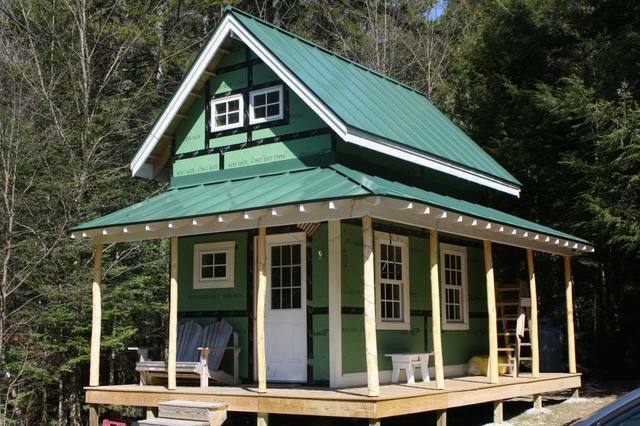 You can always take a trip up my way too, I'm off grid and have a small solar system that I can show you. There's also a company in Williamstown that's doing solar hot water and they're planning on branching out into solar electric but I don't know if they have yet. thankyou very much, so that doesnt seem bad at all. This seems more and more feasible every time I am on this forum, Everyone is very helpful here. You're welcome. It's a good forum, for sure. So many people have been doing all kinds of different things and they're all willing to share what they've learned, what works and what doesn't so you can save a lot of time and headaches. I've been doing the whole off-grid and compost toilet thing for almost 10 years so I've got some experience with what it's all about. Abbey - I'd enjoy seeing your setup. I don't think solar is in the budget for this year, but I'd like to learn as much as I can. I'll send you a PM sometime after mud season is well over. Thanks! Yes, I know I need to move the shelves. They're temporary anyway. I'll be making some bigger, longer shelves next week, hopefully. 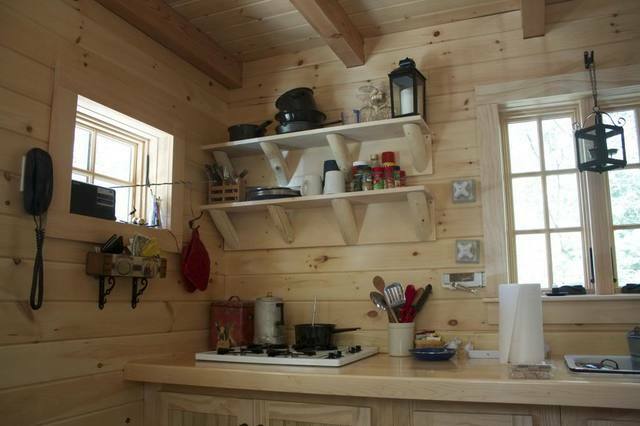 We'll get the cabinets varnished next week too. 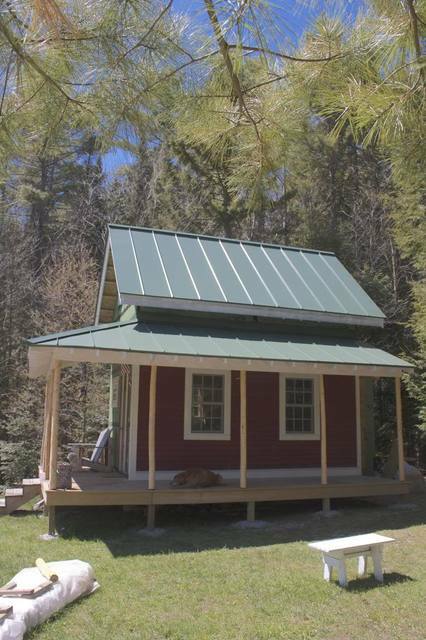 I also ordered the siding. We'll be getting over 1700 lin. 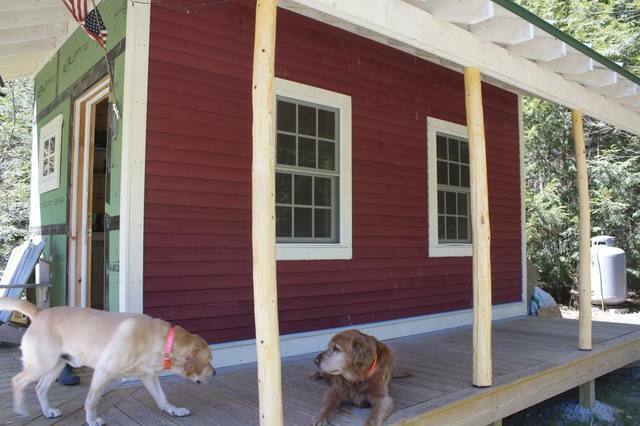 ft. of pine clapboards from a Vermont mill. I'm being a bit extravagant and getting them primed and with one finish coat, figuring that I'm paying for future leisure time. Maybe. As for the trim, I originally intended to go with fiber cement, based on recommendations on this forum and neighbors. But I agonized over it, as I've never used it before. Then I was focusing on the downsides - the weight (I'd be installing this solo, probably), the cost (isn't cement just rock? Why does it cost so much? ), and that I'd need to buy some special saw blades and dust masks. So, I kept looking around and settled on something called MiraTEC. It's a wood composite product. It's really a compromise for me, as I don't like the Azec-type stuff - it's just too too plastic. The MiraTEC is uses wood fiber, wax, and resin, so it's at least more wood than plastic. 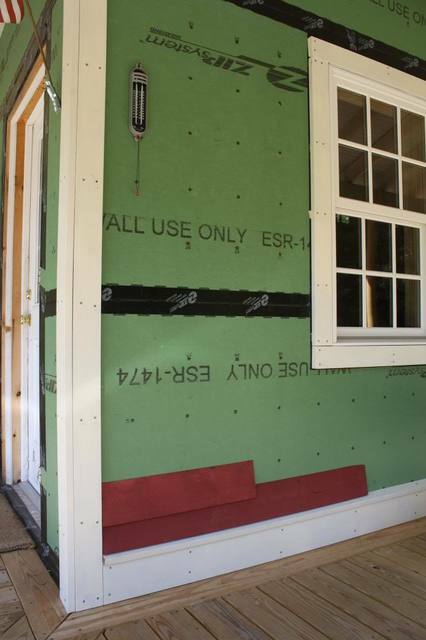 But it has other advantages such as a 50 year warranty, it's a "green" product, and it's cheaper than fiber cement. It also comes in 16 ft lengths which works better for my 10x16 cabin. I don't think I'll see a delivery for a few weeks, but I'm looking forward to covering up that sheathing. 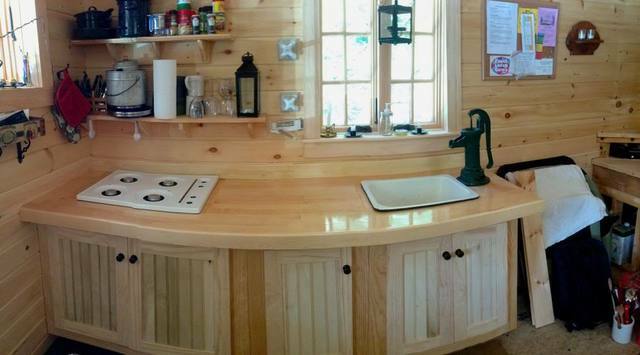 Looking good... Just one question is the counter top curved or is just the picture? Nah - it's the photo. I didn't have my good camera, and my phone isn't really good at wide angle but can do panoramas. Spring is here and so is my siding order! 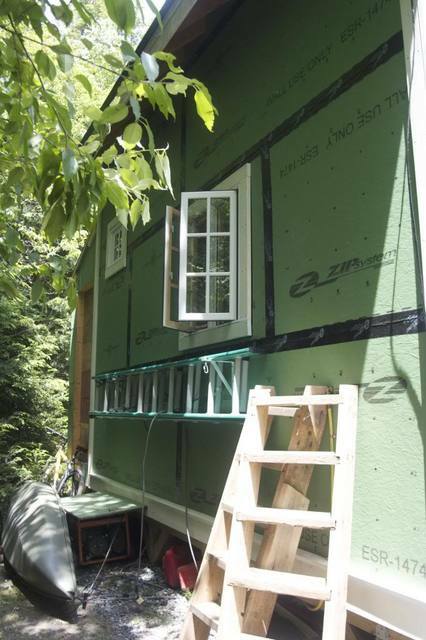 This weekend I managed to get the trim up on one side and 3 windows. While I'm really anxious to see at least one side complete, I'm forcing myself to take it a little slow. Plus the lack of certain necessary things (like nails or gas) kind of forces a certain pace. This Miratec is interesting stuff. Pretty dense and somewhat heavier than wood, but not uncomfortably so. One thing I found out quickly, pre-drilling for the 8d nails is very helpful. Otherwise, it was pretty easy to work with. I noticed a couple of details on the miratec. And that is a popular choice even with cement siding, much more fun to work with than cement trim. we take a plastic container with a lid and cut an X in the lid, slip that over a paintbrush and put an inch or so of paint in the container. You then have a good endbrush while you're working and it won't get full of dust or dry out. 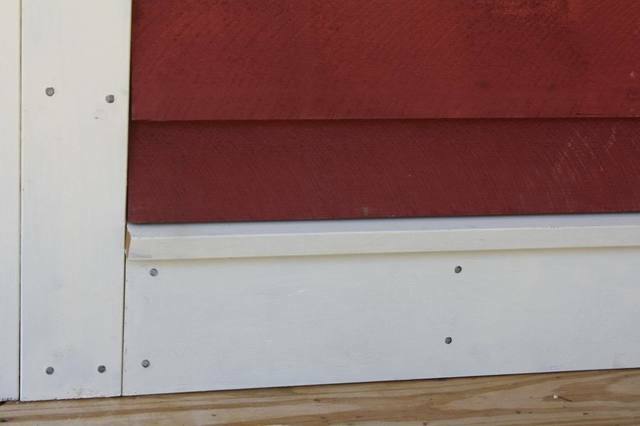 Paint any exposed end cuts or ripped surfaces on the miratec and siding before installing. It's also a very good idea to keep it up off the porch floor. I usually have painted flashing on the wall and lift the trim 1-1/2" to keep leaves and debris from constantly wetting and swelling the material. If you have a power planer I run a pass for about half the width of the backside to create a rabbet the window flange can go into allowing the unplaned portion to sit flat on the wall sheathing. One nice traditional cornerboard detail is to run each 1" thick cornerboard to the corner but without lapping them. Then run a 3/4" quarter round up the resulting inside corner formed by those unlapped corner boards. In a painted lady those beads are in a contrasting color. Very nice little place! I like it. Rich, the place is looking great. It looks (at least in the pics) like the Zip sheathing made it through the winter quite well. Care to share your impressions of that product? Would you use it again? Thanks, all. Don - that's a great tip. I had cut all the trim, primed the edges, etc., and then gave it all a coat of finish paint. The wood drip cap was the last thing I did on Saturday, and needed to trim it by a saw blade's width to get it in, so I neglected to prime that. I'll employ your tip next weekend. I did need to make an angle cut on the casing on the top of the windows so that it would fit over the metal flashing. And, I wish I had talked with you prior to putting the corner trim up. I considered and discarded other options, like a 45 degree mitered corner. I like the idea of the quarter round, but we're getting (whether we want it of not) a barn-like look. Archimedes - yes, I would absolutely use the zip system again. I'm not unhappy that I'll be finally covering up those green walls though . 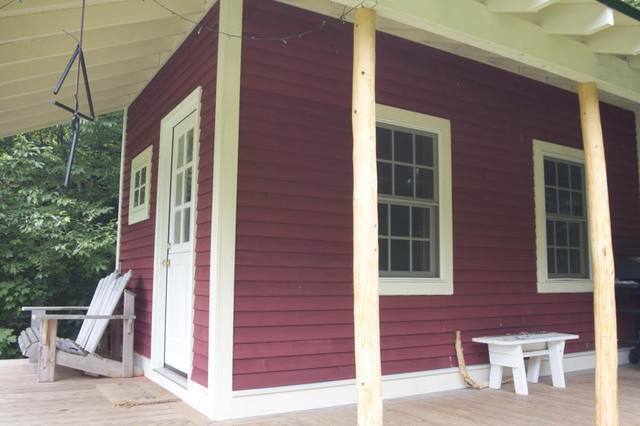 But, really, I can't think of any other solution where I could leave off siding for a year or more. 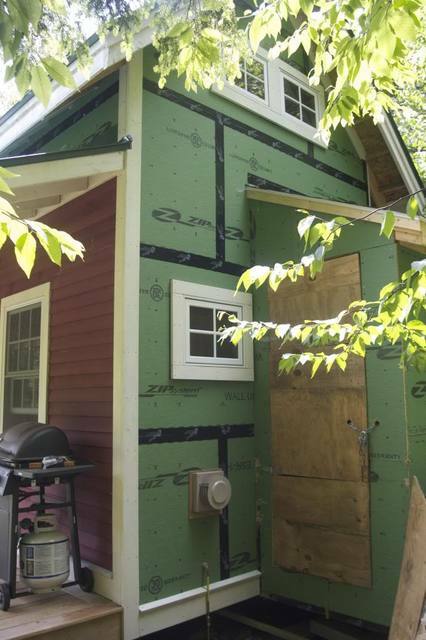 Realistically, I had hoped to have some siding up before now, but with the zip panels, I didn't have to be too worried that it was going to rot out before now. For a mostly weekender builder, anything I can do to safely put a bookmark in my work and come back to it in a week or two, starting off where I left off, makes things so much easier. Plus, there is no way I would have as much faith in house wrap, no matter how well it was attached to the house. 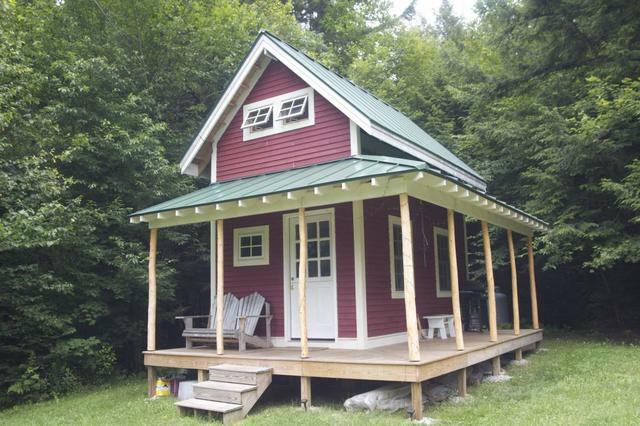 It is very cute with the wrap around porch! Just a quick update, and then off for a few weeks for a family vacation and celebration (3 kids, now officially all full-time employed, if professions of their choosing! Plus wedding anniversary, Mother's day, graduation, birthday, etc.). I put up clapboard on the most visible and easiest section of the house. It went well, once I got comfortable with the spruce clapboards and the relatively short lengths of 2 to 6 feet. I also found that stainless ring-shanked nails are the only way to go to avoid splits near the ends (regardless of how much you blunt the pointy end of the nail). Everything else is just too big. Hello from Missouri. I think I finally found a design I can get my wife on board with. Your place is charming! My question is do you have plans drawn, or are you doing it as you go. My building experience is minimal, and I would do better with plans. The ones I have looked at online have not given me the"that's the one" feeling that yours has. Thanks. Thanks Doc! I have to look on a backup hard disk, where I hopefully have the SketchUp docs I made. When I do find them I can just send them or make them available somewhere. You're welcome to use them, and hopefully add your own improvements. With family events and concerts, I don't expect to get anything more done for another month Oh well. Summers are like that sometimes.